Cool expanded mechanic of arcade space games, please keep it up! Very neat idea, took me a couple of goes to get the controls fully but otherwise really like it. Got a bit of problems timing the roll to avoid the wall-barrages of the enemies but the rest looked good. Consider making powerups you can buy to change the control modules (other types of shots, phase in-out to dodge,etc. ), or upgrades to make the modules more efficient. Awesome entry, the look and feel is incredible for 2 days of work, with nice pixel art, animations and even character comments :) It's a lot of fun! I also really enjoy the gameplay, and could well see this turned into a full fledged game. I like the WASD + Arrow keys controls, with four modules that you can use while taking care not to overheat. Amazing graphics and sound effects. The whole idea is really neat, I think this has a lot of potential! I REALLY enjoyed this game. I liked all the commentary that Mako had, as it really helped to add some charm. One thing that I noticed was that the playable area was tiny. It's like a third of the screen. If you flipped it so the playable area was 2/3rds of the screen with the HUD and Mako occupying the remaining space, it would really enhance the experience and provide more room for enemies, obstacles, etc. What you said about highlighting the engine modules makes sense and I can see what you are going for. I love that kind of stuff. You could really draw attention to that by having a smaller HUD but displaying a large overlay for a split second with a detailed animation. 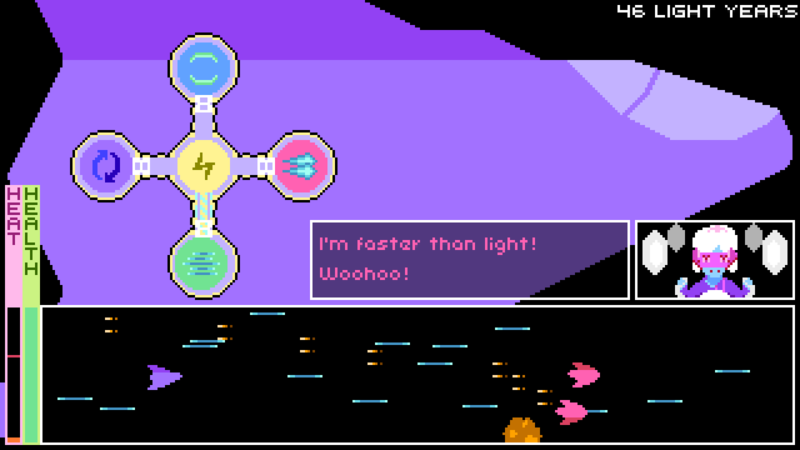 This could happen before going FTL or perhaps firing a super-powered version of the weapon. Anyways, awesome work and I'll be following as you continue development. Hey man, you did a very impressive job in this game... Congrats! Replacing basic movement with ship management: genius. And the visuals and sound are pretty excellent, too. Five stars across the board. The overall feeling is nice and polished, liked the mechanics, even having half of the screen to show the current ability. 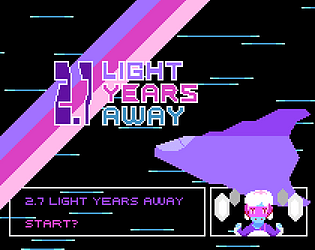 Can find some similitudes with undertale and FTL, nice work! Brilliant mechanic. I feel like there's a lot more you can do with it given more time to experiment with it.